What’s a Link, and How do I Share it? Wherever you see text in a different color, and usually underlined, it means you can click and be taken to another place. You click on them all the time, but how do you make them? It can be done on web pages, emails, text messages, and Facebook posts. Just about anywhere you can type text, you can make a link. Here is Chris and Jim’s photo album from our Cuba trip. The link itself is a web address, a URL (universal resource locator). The actual link to the Cuba photo album looks like: https://goo.gl/photos/dMG1XzKNvEGVrBhNA The URL can stand on it’s own as a clickable link. In order to have a URL, a piece of content must be stored somewhere on the Web. I cannot give you a URL link to photos that are stored on my computer’s hard drive, but I can give you a link to photos stored on Google Photos because they are on the Web. The text you want to describe the link. It’s a lot clearer for someone to click on a link like: Cuba photo album. If you are using your phone to read this article, you can send a link using a text message. The key is to know how to copy the URL of the article. The URL is located at the top of the screen, in the address bar. To copy it, you touch and hold (long press) on that bar, then tap on Select All, then Copy. See Longpress for Copy and Paste for video explanation. Once the address is copied, you can open up a text message and Paste it by using Long Press and Paste. This gets the full address link (#1 above) into your text message. For text messages, that’s as good as you can do. There is no way to create your own text like #2 above. 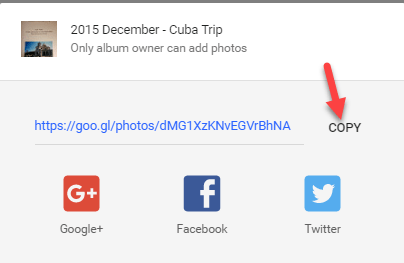 When you click ok, you will see a link in your email message that looks like: Cuba photo album.